Upper Arm Liftgo ahead, go sleeveless! Tired of choosing outfits based on what will best hide your arms? Loose, sagging skin and fat on the upper arms is no fun to deal with, whether your arms have lost tone due to aging, or you have excess skin after losing weight. Unfortunately, no amount of tricep curls or push-ups are going to help stretched, sagging tissues. One thing that can help? Brachioplasty, or arm lift surgery. This body contouring procedure removes excess, sagging skin and fat to restore a firmer, more slender upper arm shape. If you’ve ever waved to a friend, only to notice that your arm keeps going for a few more seconds after you stop, then you know how the shape and tone of your upper arms can affect your self-confidence. Sagging or “flabby” upper arms can also make wearing sleeveless clothing—or tops with fitted sleeves—a challenge, as the excess tissue gets in the way. Arm lift surgery with Dr. Clark can resolve many of these issues by removing the excess skin, fat and other tissue, reducing the circumference of your arm and restoring a firm, toned appearance. Dr. Clark performs upper arm lift procedures in our private, accredited surgery center, using general anesthesia provided by a board certified MD anesthesiologist. The procedure involves a linear incision placed along the underside of the upper arm. 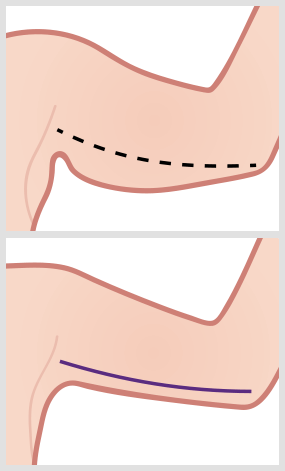 The length of the incision varies depending on the extent of tissue removal needed, but arm lift surgery will leave a scar on the underside of the arm. However, once healed, this scar is very thin and concealed unless you raise your bare upper arms above your shoulders. Recovery for an arm lift is reasonably short compared to other body lifting procedures. Most patients are back to work within 5 days and can resume exercise about 2 weeks after surgery. Keep in mind that if you are having other procedures along with an arm lift, recovery may be longer. Read more about recovery after body contouring procedures. Brachioplasty is designed to address excess, sagging skin beneath the arms; it will not be effective in removing a large amount of fat. If you have good skin contraction, but are bothered by fullness in the upper arms caused by excess fat, a fat reduction procedures such as liposuction or CoolSculpting may be a better option. Dr. Clark will help you understand your procedures options at your consultation. Contact us about arm lift.